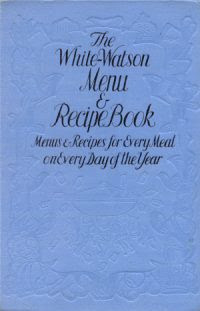 I have to admit, I have a soft spot for recipe books with daily menus. This little gem has a whole year of them: Breakfast, Luncheon, Dinner, High Tea and Supper. Not that it was intended that one eat all five meals a day. 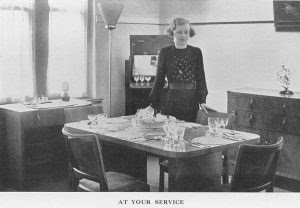 A note in the authors’ preface states that menus for High Tea are included ‘due to their popularity in the North of England and Scotland’, although at the time High Tea and Supper might easily replace dinner for children, the rushed or just the plain strapped for cash. And : ‘In planning the menus, the beverages to be taken at breakfast and tea have not been suggested, neither have bread and butter and jams been given; these are not the matters which trouble the housewife; it is the obtaining of variety in such foods as meat and vegetables, soups, fish, sweets, egg and cheese dishes, which cause her perplexity.’ Indeed. 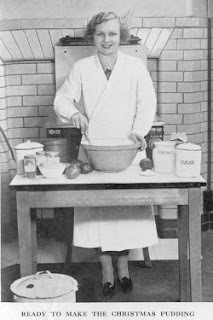 As in so many books of this period we are given a chapter on ‘Invalid Dishes’ and, more unusually, one on cooking with ‘Tinned and Bottled Foods’. Breakfast: Porridge and milk; Poached eggs on toast. Luncheon: Baked Halibut, mashed potatoes; Fruit in Jelly. Dinner: Julienne Soup; Mixed Grill, grilled tomatoes, potato ribbons; Queen of Puddings. High Tea: Stewed Rhubarb; Vanilla Buns. Supper: Lobster Salad (Tinned Lobster); Cheese and Biscuits. The food suggested is always very seasonal, with lots of fish and much use of offal and such delights as calf’s head and brawn (ick). Cream the butter and sugar. Add the eggs and the other ingredients. Place in little heaps on a greased tin. Bake for about 10 minutes. Cool on a tray.